A: I live in the Chicago area, married with three kids who are 21, 18 and 13. I currently have two online startup businesses after founding and running a company for 10 years and then selling it to Fortune 100. A: I had a lifelong yearning to become on entrepreneur and having accomplished that is really what gave me the spark. I dreamed of being an entrepreneur since high school and survived years of goofy ideas that I never acted on and just prior to my 30th birthday I was able to start my first company, Technology Resource Center. It was after running that company for ten years and selling it that the book came to me and I wanted to share that experience with other entrepreneurial dreamers as well as people who were already running businesses. A: I think most entrepreneurial books fit in two categories, one being via graphical tales, and the other instructional tales. I wanted to create content for the entrepreneurial dreamer that took them through each stage – the idea, startup, running and exit. I weave my personal stories and examples but what separates my book is the core question that I set out to answer which is why do some people seem to effortlessly act on their idea and create something while others turn ideas constantly and fail to take action. A: I suggest the reader read it from cover to cover because my story flows from beginning to end. A: The book takes the reader through a journey – the four stages of the entrepreneurial lifecycle which are the idea, the startup, running and exit stage. In the idea I define what an entrepreneur is and how he or she is different from a business owner. I think it’s critical that people understand what an entrepreneur is because it is a very over used business title. I show the history and evolution of entrepreneurism and how it pertains to the readers’ journey. I also try to relate to the entrepreneurial dreamer what it’s mentally and physically like to be an entrepreneur. I go into ideas in innovation and answer a burning question of how to activate your ideas. The first part of the equation in the entrepreneurial formula is the word IDEA – Innovation, desire, effort, ability. This is what an entrepreneur needs to go through the startup phase. The book then progresses from IDEA to STARTUP which is when you actually become an entrepreneur. I touch on the pitfalls that entrepreneur startups run into. Also what is required and what happens physically and mentally at this stage. And mastering your funding, resources and what the primary role of an entrepreneur is. I end this section talking about partners and employees. In the next section, running phase, I focus on demand fulfillment. Making your company known and running a business you are constantly adapting and changing as you learn more about your customers and business. You know you have entered this running phase when you start to get orders and you are doing fulfillment. I focus on leadership, culture, evolving as a leader, the art of selling, maintaining a culture of innovation and scaling growth. The last section I talk about the entrepreneurs exit plan. I like to say that every entrepreneur is going to exit their business either standing up or lying down. Ignoring this reality is irresponsible to yourself, employees, customers, investors and family members. I talk about knowing the signs when it is time for you to move on. If you are selling I give tips on how to put your company on the market and how to negotiate the sale. I supplement all this through my experiences just as informational and examples to help add some vision into the experience. A: My sales formula is really the most relevant. Learning what to look for when a sales person is struggling is the key. And I believe you can use this formula to target improvement and I believe it is a universal formula. A: Awakening the Entrepreneur Within by Michael Gerber and The Lean Startup by Eric Ries. A: The best way to find me is at Linkedin where I post blogs and I encourage invites. 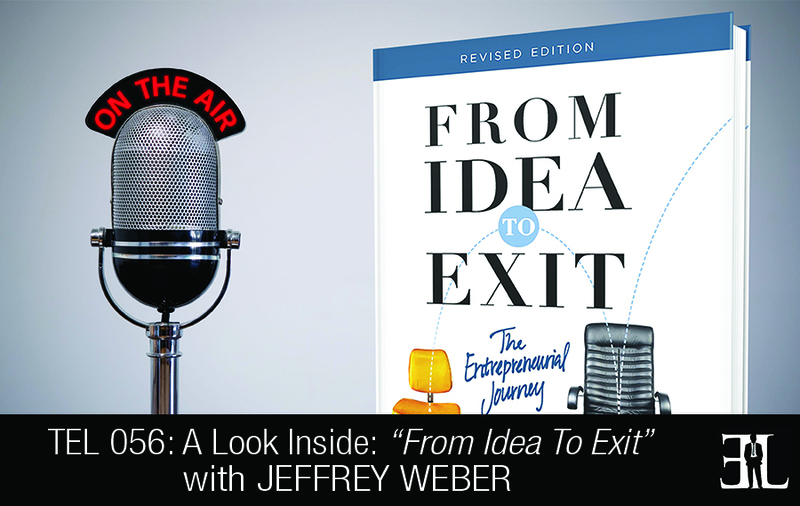 Are you interested in Jeffrey Weber’s book From Idea To Exit? Buy it now on Amazon OR if you’ve already read it, let us know your thoughts and opinions about it in the comments below. DO YOU WANT TO HEAR A PARTICULAR BOOK ON THE EL? 1) What is the title of the book? 2) Who is(are) the author(s)? 3) What makes it great for entrepreneurs?